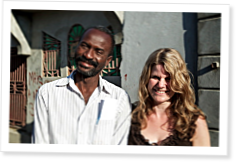 One year ago, Julie Roberts funded five microcredit loans to five struggling families in McDonald, Haiti. In Part 2 of this three-part series, Emily Beers takes a look at how Roberts’ seeds are growing. In a concrete-walled church in the rural Haitian village of McDonald, 250 or so people gather to listen to Gabriel Nixon, the unofficial village leader. He has gathered his community this evening to introduce the North American guests visiting McDonald for three days. Julie Roberts, the president of Community Builders Group, has been to the village many times before. Some of the villagers know her because she has been funding various projects in McDonald—projects that have directly benefitted some of them. But most of the villagers have never spoken to her, and they certainly have never met her four CrossFit friends from Canada and the United States, who have tagged along this time. Children point and shout “Blanc! Blanc!”—slang for “white person”—as they stare curiously at the five white people sitting in the front row of their church. Before Nixon introduces the visitors, he takes the microphone and launches into a boisterous speech. His self-assured voice commands immediate respect. It inspires. “We can have a better life. We can,” Nixon says in his native tongue, while someone translates into English for the North American guests. “If we have good ideas and we work together, we can. We can. We can,” he continues, almost turning it into a chant. Part 3 will take an in-depth look at more of Roberts’ efforts in Haiti.